Which comes first, Crossrail or the General Election? It's a trick question, obviously, and the answer is Crossrail. More specifically that's Crossrail Place, the new retail destination at Canary Wharf. You may have spotted it being built in a former dock to the north of the main skyscraper village, indeed if you've been past on the DLR you can't have missed it. It's a huge long building that from the side looks like an ocean liner with a cricketer's shinpad dropped on top, or from each end like an alien snake baring triangular teeth. 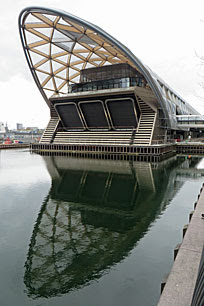 It's going to be Canary Wharf's new Crossrail station, or at least the very deepest levels are. But two floors above ground and two below are to be devoted to a retail and leisure complex, and that's Crossrail Place. It's not a very original name, but then where at Canary Wharf is? The long shopping mall at the heart of the development actually has three separate names - Cabot Place, Canada Place and Churchill Place - each in reference to the development they're buried beneath. The parallel shopping mall leading off from the Jubilee line ticket hall is called Jubilee Place, because that's supposed to help remind you where it is. And so this new shopping mall is to be called Crossrail Place, again hijacking the name of a new railway to sell handbags, suits and food. And Crossrail Place opens on Friday May 1st, a mere ten days from now, which is how you'll be able to pop in for lobster and chips before the General Election takes place. What's amazing at this stage in development is how Google-unfriendly the phrase 'Crossrail Place' still is, with only very minor trumpeting having taken place thus far and the big splash yet to occur. Wander round Canary Wharf's existing malls and you'll now see digital ads for stores at Crossrail Place flashing up to raise awareness. But the wider community has been told nothing, so there's a very real risk that London's cutting edge brandoholics may miss an opening special offer. So what are we getting on May 1st? I strongly doubt that the residents of Poplar, a brief walk across Aspen Road, will ever be lured into their new local mall with a combination of shops like that. But this new development isn't aimed at them. Instead, as Canary Wharf expands outwards and upwards, its financial workers and apartment-dwellers are clearly in need of yet more places to gather and spend money. It seems Crossrail Place will literally be filling a hole. Thankfully there's to be more at Crossrail Place than just food joints for bankers. An extensive roof garden is planned, indeed is probably already nearing completion, indeed looked half-convincing last September when many of us trooped through this building site for Open House. It promises to be green and proper pleasant, unless of course it's filled not only with plants but copious tables for the sipping of cappuccinos. At the heart of the roof garden will be a performance space where an Isle Of Dogs-based theatre group will put on music, dance and theatre, with the inaugural festival taking place over the weekend of May 16th. See how deftly the site's developers ticked all their community boxes there? And you can't see it from the outside, but an independent boutique cinema has been built on Level -2 with after-work relaxation in mind. There'll be three screens with capacities of 109, 52 and 105 respectively, each with "a mixture of premier armchair and sofa seating with footrest". Tickets for the first screening of Mad Max: Fury Road (3D) on May 15th are now available for only £19.20, plus 75p online booking fee, plus an extra quid if you don't bring your own 3D glasses. A direct hit on the wallets of the target audience there, I think. 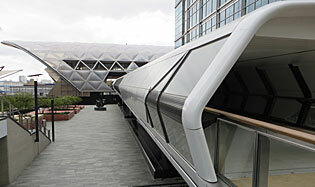 Access to Crossrail Place will be from the North Colonnade immediately opposite 1 Canada Square, via an elevated walkway that looks straight out of Space 1999. Alternatively you can descend to former dockside level and cross a paved piazza complete with jet black water feature, this already open bar the dark blue hoardings covering the end. The whole area's dead at present, indeed you may never have ventured this way out of the existing shopping centre/DLR complex. But footfall will start picking up inexorably next month, they hope, until Crossrail Place is as much part of the everyday retail offer hereabouts as Jubilee Place and all the other Places. And eventually the trains will arrive. Crossrail is currently scheduled to start running on this southeastern branch in December 2018, which is still three and a half years off, with the complete network not up and running until December 2019. And that's less than six months before the country next goes to the polls in May 2020, assuming whatever hybrid government we get limps on that far. Indeed the correct answer to "which comes first, Crossrail or the General Election?" is ultimately Crossrail, but only just. At least you can have a chai latte and oyster platter while you wait.